For nearly a decade, the Turnpike Troubadours have been standard bearers for the ragtag, raw, honest, genuine type of country music favored by folks in this region. The band, fueled by the Walt Whitman and Larry McMurtry infused lyrics of frontman Evan Felker, has always stood apart from peers and imitators because they are so damn good…and so damn real. The characters in the songs, be it Jimmy, Lorrie or unspoken are people you know from your own life. Felker has the uncanny ability to distill the most specific life events into the most appealing of measures. 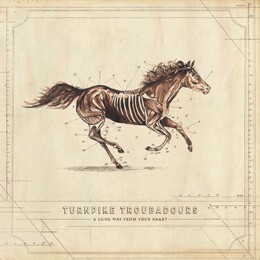 “The Housefire” kicks off this new collection (A Long Way From Your Heart) and is, sonically, vintage Turnpike. Booming fiddle riffs from Kyle Nix introduce the song before giving way to a quieter verse backed by the rolling steel guitar of Hank Early, all working to cradle the fantastically mundane storytelling of Felker’s pen before giving way to a blistering Tele turn from Ryan Engelman. RC Edwards is the yin to Felker’s yang and the low-end master of balance that holds the whole damn thing together (and so it goes for each successive song on the record). The lyrics of this song are exactly as the title would suggest and work to add another chapter to the legacy of Lorrie and remind just what a damn fine songwriter Felker is. Track 2, “Something to Hold On To” is another version of Felker at his finest. Each Turnpike record has featured songs where the protagonist in the song is wistfully confronting love lost, love squandered and love fooled…and that’s this song. He’s searched around and never found a lady quite as good as the one he’s let go of. What really kills him is he knows exactly what she’s up to and where at the exact moment, and the fact that he can’t be there too is some damn fine heartbreak put to song. And so it goes throughout the rest of the record. “A Tornado Warning” has a Bakersfield/Paul Cauthen sound that rides Engelman’s groove right into Nix’s fiddle as Felker paints the backdrop. It’s a beautiful thing…as is this entire project. I could go on track by track…but you get the point by now. You know what to expect from this band. They know what they do best and they keep getting better at it. When expectations are high, sometimes it’s hard to meet them. Turnpike has managed to exceed them. They have yet to put out a bad album, and this just may be their best. Many bands reach the top of the mountain and flounder. Turnpike is flourishing. Whatever the process may be, it’s working. Is Felker talking to himself? The audience? A former love? Current adoration? All at once? The lyrics alternate between confidence, scorn, anecdotes and regret…sometimes in the same line. That’s his genius. Everyone relates. Coupled with the fact that the backing instrumentation from the band is the finest country music being made in the world, Turnpike Troubadours have become a machine that shows no signs of slowing down. Wow, ddas ist schön angenehm Schriftstück, meiner Schwester analysiert diese, daher Ich werde sagen, informieren vermitteln sie.